The FDA has taken legal action to stop Amish farmer Dan Allgyer from shipping raw milk across state lines, according to this article. This case against Allgyer has been going on for quite some time. Allgyer’s Lancaster farm was visited/inspected/raided by federal agents a year ago. Allgyer has been selling his milk in Maryland and DC, violating rules against interstate sales. His customers are said to be “furious at what they said was government overreach”. Dry cornflakes are enough to get me furious. Raw milk is a pretty controversial issue. One of the issues is health. Proponents claim it is better for the body. The FDA says it is potentially dangerous and “should never be consumed”. Some suspect financial motives. One defender of raw milk accused the government of being “in cahoots with the large milk producers”. 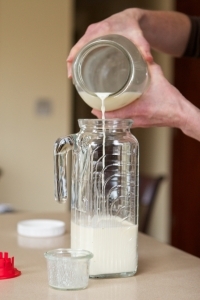 Raw milk laws vary. The article notes that it is “perfectly legal” in 10 states, illegal in 11, and under various levels of restriction in the remaining 29. If you’re curious about your state, here is a map outlining raw milk laws. And if you missed it the first time, we had a look at this issue back in February in “‘Shadowy’ Amish raw milk smugglers“, with an accompanying undercover–and highly odd–video of Amish milk smuggling in New York City.